Air is invisible, which is probably why many of us forget that it ever exists! Yet we cannot live without it. Neither can plants or for that matter, any other complex living organisms. So when you are planning an indoor grow system, you also need to focus on air supply. This is where reliable grow room ventilation system becomes crucial. Without such a system, your hydroponics grow system is doomed to failure. What Is Grow Room Ventilation? A grow room ventilation is a system that ensures a continuous flow of air between the outside world and the indoor grow area. It also includes some mechanism for keeping airflow inside the grow room. 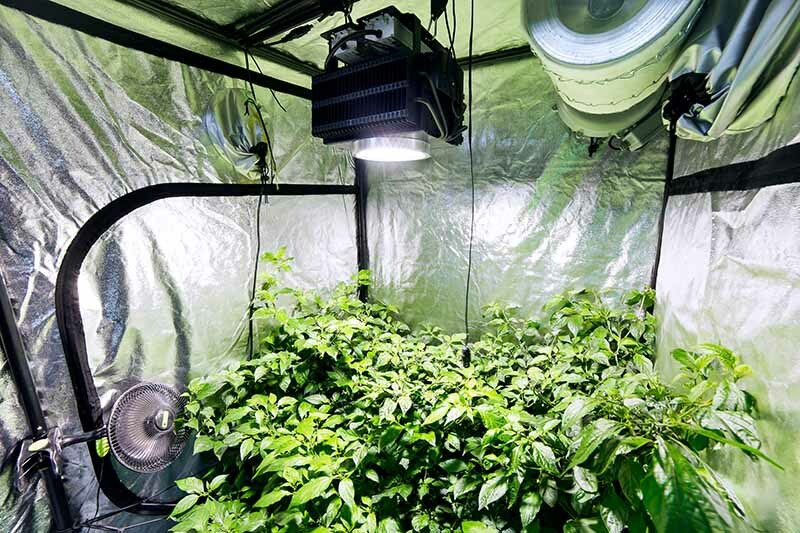 The most common grow room systems use a combination of exhaust fans and ducts or pipes to maintain airflow. And circulation fans are used to keep the air flowing within the room. Groom room ventilation is an important concept you should learn if you intend to start with Hydroponics. The main focus of a grow room is to provide plants with a better growing environment than outdoors. This also means providing fresh, CO2-rich air. A ventilation system is crucial to keep the CO2 content inside the grow room at optimal levels for the plants. As the concentration of CO2 in the atmosphere is low, a constant flow of fresh air from outside is necessary. Plants are used to growing in the outside weather, exposed to the wind and elements. When they are deprived of these conditions, it can affect them in unexpected ways. 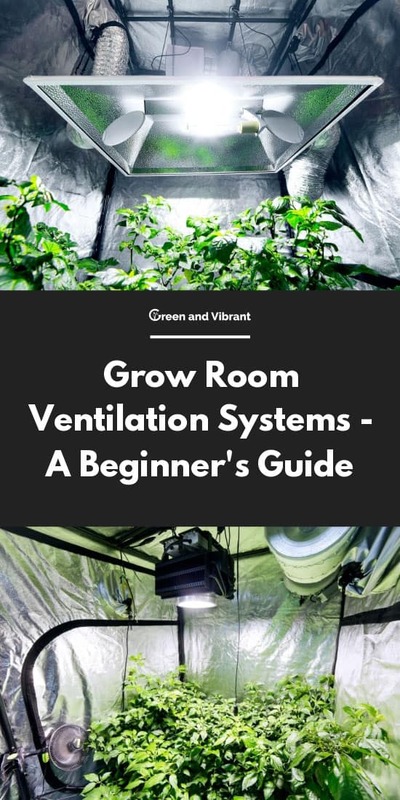 Check out the following section to learn why ventilation system is essential for plants in an indoor grow room. Ths is the most obvious benefit from a working ventilation system. A grow room is all about simulating the optimal outdoor conditions inside four walls. This also means maintaining the perfect CO2 levels for plants. In a closed system, the plants will soon run out of carbon dioxide as the keep inhaling it for photosynthesis. So you need an uninterrupted supply of fresh air from the outside. This will only help boost the growth and yield from your plants, regardless of their type or species. Plants are susceptible to temperature variations. Even a few degrees worth of change can drastically affect the quality and quantity of your harvest. Outdoors, the primary heat source is, of course, the sun. And the winds provide a cooling effect as well. In an indoor grow room, we use glow lights to replicate the sunlight. But not all lights are created alike. Some emit more heat than others. And a stagnant, still air doesn't do anything to control heat levels. But a constantly circulating air system will remove a lot of heat from the grow room. This is one of the main benefits of an efficient ventilation system. Plants are very efficient humidifiers. Take a tour through a tropical jungle, and you will learn this firsthand! Imagine the situation inside a grows room with zero air circulation. All day long, the plants will be expiring water vapor. Humidity attracts a lot of insects and other unwanted pests. It can also have a damaging effect on the health of the plants themselves (unless they are tropical species). Along with the excess heat, a ventilation system also dumps out the excess moisture in the air. Dry air also takes away some of the water from the upper parts of the plant. This forces the plant to absorb more water through the roots,.Along with the water, the plant also takes in more nutrition from your hydroponics system. The net result of this process is slightly improved growth. Still, stagnant and humid air has a negative impact on all surfaces in your grow room. The topsoil, or the soilless medium of your choice, is particularly vulnerable. In stagnant air, the medium will remain damp and humid. This can very well attract fungi, mold, mildew and several insect species. Dry soil slows down the growth and reproduction of pest populations. To maintain a healthy level of dryness in the topsoil, you need a steady supply of relatively dry air. Also, still air allows flying pests like gnats free access everywhere. If you have fans maintaining a breeze inside the room, the insect activities can be controlled further. Human muscles are strengthened through exercises and resistance training. Something similar also happens to plant stems that grow outdoors in the wind. The non-stop swaying in the winds strengthens the stems of many plants. This will help them bear a load of fruits or seeds later on. Plants reared indoors in the closed air do not have this conditioning or strength. They are rather like unused or atrophied muscles: weak and unable to bear any weight. So, incredible as it may seem, if you want your plants to be able to grow upwards without bending and breaking under their weight, a ventilation system is essential. If you have an indoor grow room, in all probability you will need a ventilation system of some sort. Do note that by indoor grow room; we mean a closed setup inside four walls. If there is no clear entryway for air circulation, a ventilation system is necessary. A ventilation system for indoor grows needs to be tailormade for the grow setup. It has to take into account the heat and humidity requirements of the plant variety being grown. And no, you cannot depend on the existing structural ventilation systems, like grilles, vents, or ducts. You may incorporate these into your system, but you will also need strategically placed fans. Extractor Fans: you can also call them exhaust fans. These are installed to take away the hot, and humid air from inside your grow room or tent. They are used along with ducting to channel the air away from the room. Ducting fans can be found cheap online for this purpose. Oscillating Fans: These can be your average pedestal fans. Their main purpose is to keep up a nice and gentle breeze inside the grow room. Their setup is relatively less complicated when compared to the exhaust fans. If you have a larger grow room, you might have to use multiple fans. The basic system mentioned above is also called a “passive system.” Such systems only have a fan to blow out the hot air from inside the room. There is no intake fan to bring in the fresh air. Instead, fresh air is allowed to enter through an intake hole or duct, based on the negative pressure created inside the room. For this system to be effective, the intake hole needs to be much larger than the exhaust hole or duct. Or you can use multiple small intake holes to provide adequate suction. A better option for larger grow rooms is an “active intake system.” In this setup, an extra fan, called the intake fan, is added to the mix. So to balance out the effect of one fan blowing out the air through the exhaust hole, you have another fan bringing in fresh air through the intake vent. In this system, relative sizes of intake and exhaust vents do not matter much. Such a system should be considered in grow rooms where you cannot have larger intake holes for passive systems. 1. How to choose a fan for a basic ventilation system? 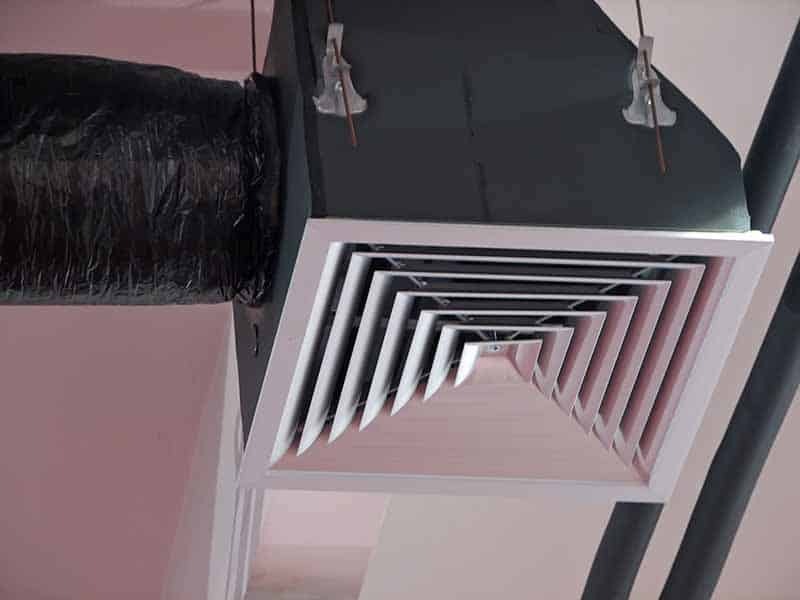 For beginners, a simple in-line duct fan is the best option. To find the perfect fit for your grows room, find the CFM rating for the room. CFM stands for “cubic feet per minute.’ It is a common ratio used for all fans sold in the US and shows how much air the fan can move in a minute. Calculate the volume of your grow room in cubic feet by multiplying its length, width, and height. For a simple system, the CFM of your fan should be greater than this number. The guiding principle here is the idea that the exhaust fan should be able to completely replace the air inside your grow room in one minute or thereabouts. 2. What is the ideal fan size? Exhaust fans are commonly available in different sizes based on their diameter in inches. These usually include 4, 6, and eight inches models. Typically, the larger 8-inch fans are used by larger, high powered grow systems. 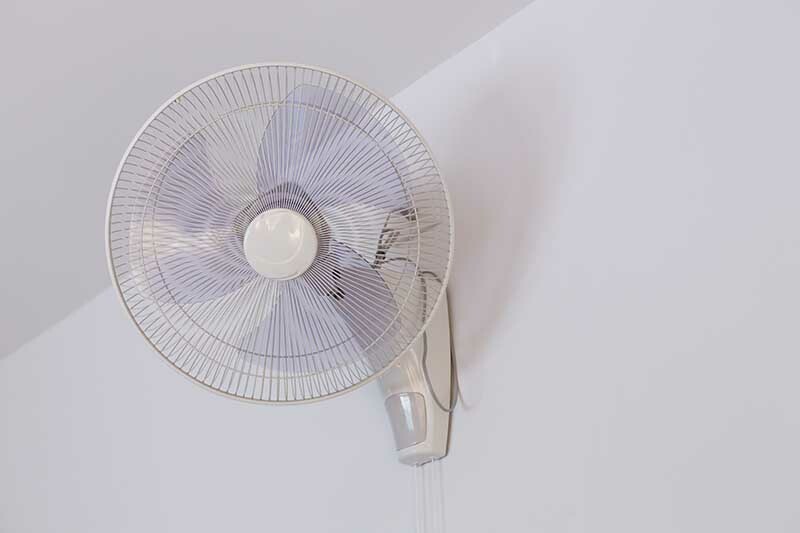 The size of fans for smaller grows should depend on the duct sizes used in the rooms. Here six inch is the norm, as that is the most common size for ducts. You can even use a 4-inch fan inside a 6-inch duct. But for this, you will need to use converters. 3. What is exhaust efficiency and how is it important? In larger and more complicated grows, the efficiency of the exhaust system is critical. It can be affected by a lot of factors like the length of the ducts, and the type and age of filters used. After calculating the CFM of the room, a simple step is to pick a fan that has a larger CFM rating. But the more accurate step is to multiply the CFM rating of the room by the exhaust efficiency drop. In larger systems, if the exhaust efficiency is not factored into the calculation of the CFM, the exhaust fan will not be able to remove all the air efficiently. 4. What about the size of the intake fan? If you plan to create an active intake system, find the appropriate size of the exhaust fan for your room first. The intake fan size can be kept identical to the size of the exhaust fan. 5. What about the ducting used in the system? Flexible aluminum is the most straightforward choice for most affordable grow systems. There are also more expensive choices available, like insulated or heavy-duty ducts. Size and length of the ducting are the most critical factors. These can affect the exhaust efficiency. Try to keep the ducting as short as possible to reduce the distance the exhaust air has to travel. You should also keep wrinkles and bends in the system to a minimum for the same purpose. Ventilation for a grow room is as important as breathable air for us humans. In the absence of a proper system of ventilation, your indoor grow will never succeed. In larger, more powerful grow systems, creating a suitable ventilation system can be a complex task indeed. But the complexity of these systems is directly proportional to the size of the grow room. So if you are a beginner, creating a basic system should not be too hard. You can even opt for an even cheaper passive system if there is enough room for large intake holes. Whatever your choice, your plants will ultimately benefit from the effort. That is certain.